7. The sooner we act, the cheaper overall mitigation will be – as little as 0.06% of annual GDP growth to hit 450 ppm CO2eq. The “substantial cuts” in point 4 are in fact 41 to 72% by 2050. In point 5 the cuts required by 2100 are 78 to 118%. That is, the upper bound requires greenhouse gases to be removed from the atmosphere. This will give a “likely” chance of staying below a 2°C increase in temperature over pre-industrial. In IPCC parlance, likely means a 67% or better chance. This is not “reasonable” as suggested in point 3, it’s reckless. To make matters worse, the chances of staying under 3°C and 4°C are also only rated in the report as “likely”. He concludes that we need more ambition and urgency, both at the national and international levels. The achievement of emission reductions at the necessary scale and speed will require transformational rather than incremental change. Wiseman goes for a three-phase emissions reduction target regime. First, a 50% reduction target by 2020. Second, zero net emissions by 2040. Third, a carbon draw-down phase to get concentrations below 350 CO2e ppm. I applaud his ambition, but, personally, would change the date of the second to 2030 and put a date of 2050 on the third. That is, we should aim for 350 CO2e ppm by 2050. Professor Kevin Anderson of Manchester University and the Tyndall Centre thinks policy makers are in a muddle about the 2°C target. 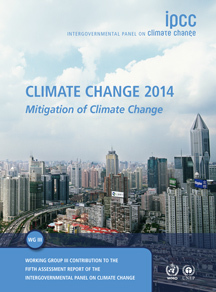 I’m not sure this IPCC mitigation report helps all that much. Furthermore, I think it misleads rather than promoting a safe climate. The WG1 science report identified the remaining carbon budget we have to work with to stay below 2°C. Rather than elaborate the carbon budget approach, which I described in the second part of this post, the mitigation report lays out a range of scenarios which involve both overshooting and the use of carbon dioxide reduction (CDR) technologies. In my view policy makers who concentrate on a less than 95% chance of remaining under the 2°C threshold (I’d prefer 1.5°C) should be immediately sacked and replaced by others more fit to purpose. Scientists writing this report have left the real challenge to the politicians, but by normalising scenarios that lack urgency I fear policy makers will descend into a bigger muddle than ever. For a safe climate, the line on the graph should be drawn where 2°C intersects with 95%. That would call for greenhouse gas concentrtions of less than 350 ppm. Back in 2008 David Spratt and Philip Sutton in the book Climate Code Red nominated 320 ppm as the target for a safe climate. They called the 2007 Fourth Assessment Report of the IPCC “dangerously conservative”. Not much has changed. Remember James Hansen nominated 350 ppm not as an end target, rather as an interim goal, whereupon we could decide the next necessary move. 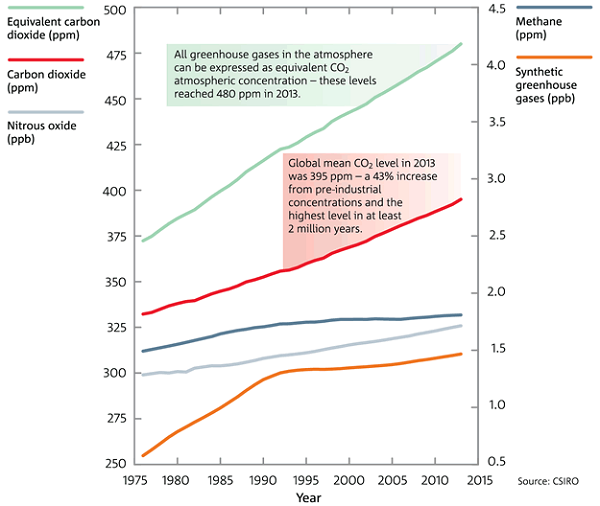 The sad fact is that scientists are not looking at scenarios of 430 ppm or below by 2100. There are too few in existence for the IPCC to summarise. In describing stabilisation pathways the IPCC collated 900 individual scenarios with target CO2 concentrations (for 2100) of 430 to 720 ppm. They then summarised the scenarios in seven categories (see table SPM1 on page 13 of the Summary for Policy Makers). It’s too large to reproduce here. The first category, the best we are offered, has the following story line. To achieve CO2e concentrations of 450 ppm (range 430-480) cumulative emissions from 2011 to 2050 must be in the range of 550 to 1300 GtCO2. By 2100 cumulative emissions must be in the range of 630 to 1180 GTCO2. Please note that the upper bound for 2100 is less than for 2050. This will require a reduction of emissions compared to 2011 of 41 to 72% by 2050 and 78 to 118% by 2100. The resulting temperature change will be 1.5 to 1.7 (1.0 to 2.8) relative to pre-industrial. This will give only a 50% plus chance of staying below 1.5°C and a better than 66% chance of staying below 2°C. There is up to a 33% chance that the temperature will go above 3°C and indeed 4°C. The second category uses a target of 500 ppm (480-530), which only yields a “more likely than not” chance of staying below 2°C, that is >50%. Each category summarises a proportion of the 900 scenarios modelled. Each individual scenario is different depending on whether cuts in emissions are made early or late. From there it obviously gets worse. Scientists may be dealing with expected reality, but they have left the real challenge of dealing with the climate to the politicians. Moreover, the action required for a safe climate, as outlined by Wiseman, lies outside the frame of the stabilisation pathways outlined in this report. Approaches such as the International Energy Association’s (IEA) World energy Outlook 2011 highlighting an energy crunch for fossil fuel power generation by 2017 probably has more effect. Here I’d highlight the article at The Conversation by David Stern on concerns that the IPCC report was censored. This is a misunderstanding of the process. The main report includes a Technical Summary which is prepared by scientists. The Summary for Policy Makers is about a third the length and results from a political filter applied at the end. The material left out, according to Stern, relates to sensitivities and bargaining positions in the current round of UNFCCC talks aimed at striking an international agreement in December 2015 in Paris. There’s more on the report at Climate Institute, at at Climate Central, at The New Scientist here and here, and at the BBC. Carbon Brief went wild, producing a dozen posts which I’ve listed here for the record. I’d recommend the first two by Robin Webster for a quick overview, but Ros Donald on fracking and Mat Hope on acronyms may be of particular interest. Independent Australia also looks at fracking and gas. Please contribute other useful links in comments. 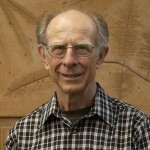 That’s one of the favourite quotes by Professor Kevin Anderson of Manchester University and the Tyndall Centre (personal website here) who, like James Hansen in the US and John Schellnhuber in Germany, is a leading climate scientist who speaks plainly about the dangers of global warming and the situation we’re in. Much of his important work seems to have been done with Alice Bows, now Bows-Larkin. In this piece I’ll refer to “he” or “they” depending on my perception of the source. Real clothes for the emperor was the title of a talk Anderson gave to unionists in June 2013 (slides here). Their basic point is that no real progress has been made since the Rio Summit in 1992 from which international action flowed through the agency of the UNFCCC and the IPCC. Policy makers in nations with ostensible targets seriously fudge the game so that economic growth is not inconvenienced.